A cute little newcomer has entered the bat ranks -- and the species isn't what people generally expect from the winged creatures. 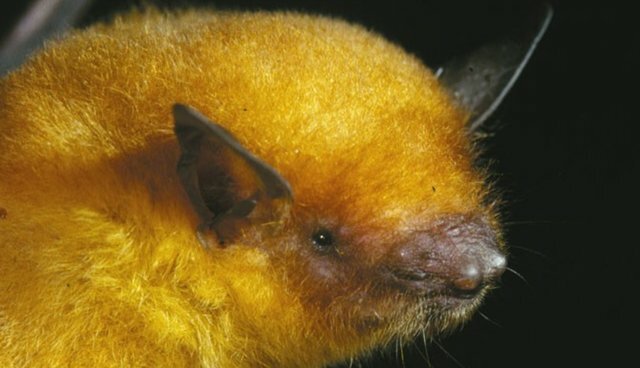 The fluffy, golden Myotis midastactus has been seen before in the Amazon, according to a recent Discovery News article, but the little bat was misidentified as a member of a similar species, Myotis simus. This was confirmed by Dr. Ricardo Moratelli from the Oswaldo Cruz Foundation in Rio de Janeiro when he came to New York to look at the bat collection in the American Museum of Natural History. Says Moratelli to Discovery News, "This news species have been misidentified... since 1965. When I put Amazon and Bolivian specimens side-by-side I realized they were two different species." This particular species of Myotis bat is unique due to its unusual yellow-gold fur. The bat actually gets its name, midastactus, from the Greek myth of King Midas and his golden touch. It is believed that the little bat lives in Bolivia, in an arid climate, though Moratelli says he has been unsuccessful in capturing any for study. His conclusions have thus been drawn from previous collections of the bat. "In 2011, I spent two months in the Brazilian Savannah (in the boundary with Bolivia) trying to capture living individuals to get fresh tissues to perform DNA comparisons but none was captured." According to BBC Nature, the conservation status of the new bat species is unclear, but it is believed that they are "near threatened." Moratelli is not discouraged that more specimens have not been found for research, however. He tells BBC that "Discovering new species is the most exciting part of my research, and in some cases describing a new species can be the first step to preserve others."